It looks like Sylvester Stallone will have to escape…again! A sequel to Escape Plan has been revealed from Emmett/Furla/Oasis Films with Stallone reprising his role of Ray Breslin, according to Deadline. I was initially scratching my head over this news of what appears to be another needless sequel, but it makes somewhat sense when you factor in its performance. Escape Plan was released in 2013 and earned a worldwide gross of $137.3 million. It only earned just over $24 million in America with the largest chunk of change coming from China: $40.9 million. Consequently, the sequel’s financing will come from a major Chinese component. Miles Chaplan, who worked on the first film’s screenplay, will return to pen Escape Plan 2, while original producers Randall Emmett, George Furla, Mark Canton, and Zack Schiller are also onboard. Pre-production will commence this coming January 15th ahead of the start of shooting on March 15th in Ohio and China. 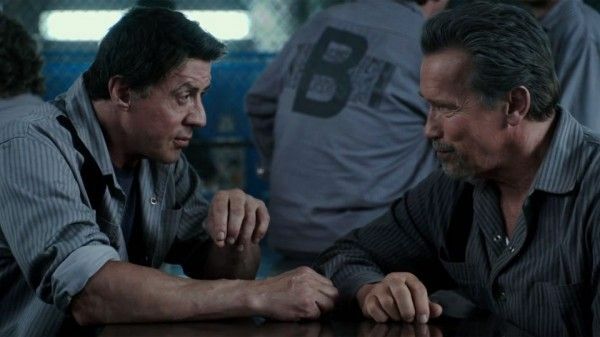 Escape Plan starred Stallone opposite Arnold Schwarzenegger in a supporting role. Ray, one of the world’s leading authorities on structural security and breaking out of jail, agrees to try his hand at escaping a top-secret facility called The Tomb. He learns that this is all a ruse to wrongly imprison him in a virtually inescapable prison, so he then teams with an inmate (Schwarzenegger) to break out. Swedish director Mikael Håfström helmed the project, while 50 Cent also featured in the cast. Stallone, however, will be taking a supporting role in Escape Plan 2. Plot details are unknown, but you may recall him saying that, in order to escape prison, it helps to have help from someone on the outside or on the inside. Perhaps Stallone will be such a player in whatever crazy concoction is in store audiences next — unless, that is, he gets imprisoned again.